VideoSaver is a screen saver which plays one or more videos of your choice. Download or create your own videos, then add them to a playlist (you can create as many playlists as you like). 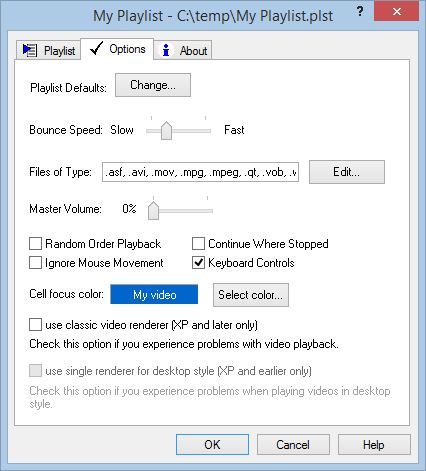 VideoSaver supports the same video formats as Windows Media Player (except for copy-protected files). Settings like size, number of loops, etc can be configured individually for each video. Enable bouncing if you want a video to get moved around the screen during playback. Playback in random order is supported, and you can configure VideoSaver to continue playback where it left off the last time. The above picture shows VideoSaver's multi-monitor support in action using Monitor style, with one instance of the video on each monitor. With Desktop style, the video gets stretched across all monitors. See Multi-Monitor Resources for more information on multiple monitors. Copyright 1998-2019 by Realtime Soft AG. All rights reserved.